My name is Laila Rashid. Approximately 3 years ago, I first received training in hijama with Health Means Wealth. This was a one day workshop and gave me a brief insight into hijama. I did this with the intention of reviving and following a sunnah. I have since then by the permission of Allah swt helped family and friends in optimizing their health. A year or so after this I suffered from severe stomach pains, many times the pain would become so severe that it would become unbearable to stand. I would have to go to A & E in hospital and would just be given a strong pain killer called Tramadol. The doctors did further tests including an ultrasound scan and found nothing that could explain the pain. Alhumdulillah by the grace and mercy of Allah swt, I found a Syrian sister who performed hijama on the spots behind my stomach on either side of the spine. A lot of clots were removed and cups filled quite quickly. I was extremely astonished to find that those pains never returned. So often we turn to western medicine before seeking help from Allah swt and his sunnah. This taught me a lot and since then I have been fascinated by the therapy and treatment that hijama brings as well as prophetic medicine that is completely perfect and flawless and comes with absolutely no side effects unlike western medicine. During this period I asked Allah to bless my work and further allow me to benefit my Muslim sisters allowing me to become more skilled and to place baraqah in my work. Alhumdulillah by the grace of Allah, I found Hijama Nation and decided to embark upon their course. During my course with Hijama Nation, Alhumdulillah I have gained a great deal in terms of the history of hijama and where it originated. I was fascinated to know that cupping was once widespread throughout the whole of Europe and Asia and dates back all the way to ancient Egyptians, Greeks and the Chinese. I was also interested in the ruqyah and metaphysical links to hijama and have begun to incorporate the recitation of ruqyah ayahs whilst performing hijama on my patients. There is much shifaa in the words of Allah swt and I felt this was very important. During the course, I gained a better understand into the physiology and anatomy of the human body and this allows a better grasp of human disease and the organs affected. This effectively allows to assess the patient’s needs better and provide a suitable treatment plan. Certain diseases and their correlating hijama points is interesting and is something that will always be referred to before each consultation and treatment along with the benefits of sunnah points. My understanding of the lunar cycle and its effects on hijama therapy is something new to me and I have realized the importance now of trying to adhere where possible to treatments being performed during the mid month time. Its been a wonderful experience for me and I have gained so much understanding, I plan to study more hijama related literature in the near future and hope and pray to become more skilled and proficient through experience. My practical day with hijama nation allowed me to gain the skill of cupping and ensuring the procedure is done with patient care being our fundamental concern. I recite during each hijama session and take time to make dua for each patient individually. 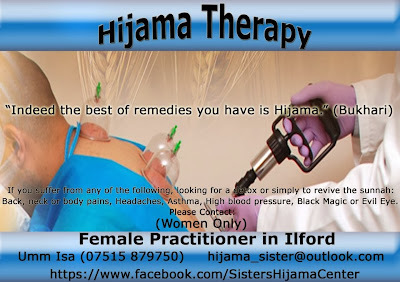 As a hijama therapist, there is so much pleasure and satisfaction when people return to you pleased and to see how their lives have improved. I always remind my patients that your treatment was from a sunnah and it is Allah who cures. I fear for them to associate their relief to me rather than the all powerful , one of Allah’s attributes (Al Shaafi – the healer). I like to also advise every patient that has received cure from hijama, to think of it as a kick start to a new way of life that involves more spirituality and worship. A better and healthier diet and a more active lifestyle. Our thanks to Laila Rashid for sharing the above post. If you have any questions or want to leave some feedback, then please do so via a comment* below. Cupping Therapy is the oldest & most globally practiced medical treatment in human history. It is a traditional, time-honored treatment that remains favored by millions of people all over the world. Cupping Therapy is a gentle therapy that uses negative pressure, instead of compression of the muscles, for incredible results. The negative pressure releases tight tissue helping to loosen adhesions & draining fluids & toxins from the muscles & body. It brings a flow of fresh blood & nutrients to the muscles & skin. It is a safe & comfortable therapy, yet is very powerful & at the same time very relaxing. Cupping is incredibly effective for many health problems. Benefits of Cupping – This gentle therapy uses negative pressure, instead of compression of the muscles, to pull stagnation from the tissues & bring it to the skin level. Deep muscle 'knots', tightness & soreness are gently relieved as the tissue loosens & is stretched. The pores expand to discharge some of the wastes & toxins, the rest are flushed by the body's circulatory & lymphatic systems. Fresh revitalized blood, oxygen, & nutrients are brought to the area. Inflammation, joint pain, stiffness, & arthritis pain can relieve. Congestion in tissue, including the lungs, is broken up & expelled. The immune system is strengthened. The nervous system is stimulated allowing a deep relaxation to move through the body. Interested people who are suffering from chronic diseases like backpain, joints pain, gout, anlylosing spodylitis or any life style diseases like hypertension, cholesterol or obesity can contact to Dr Izharul Hasan, Dept of juris and toxicolgy, AU Tibbia hospital, Karol Bagh New Delhi for cupping therapy.